Throughout the day there was so much entertainment, from the Military Wives Choir to history talks and live music, the volunteers really pulled out all the stops. One of the highlights was a fashion show by Blitz Buddies- the commentator and all the models were so fun and enthusiastic about their clothes, many of which were originals with some modern reproduction garments. Vintage Gal did a lovely detailed write up with close ups each of the outfits, so be sure to check out her post HERE. In the evening, Sam and I dressed up ready for the Victory Dance, where we had an hour of basic dance steps followed by music from The Marionettes, DJ UXB, The Goodnight Sweethearts and Ricky Hunter. 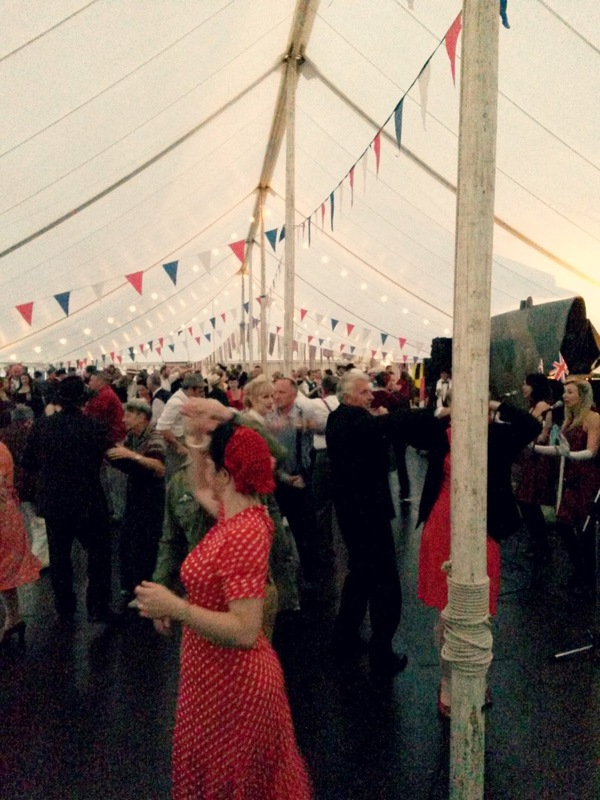 The soundtrack of the night featured the likes of Glenn Miller, Frank Sinatra and Nat King Cole- right up our street in music taste! Despite never having properly danced Swing or Lindy Hop before, we gave it our best go and had an absolute ball (excuse the pun) even though we tripped over each others feet and were out of time to the music quite a bit! 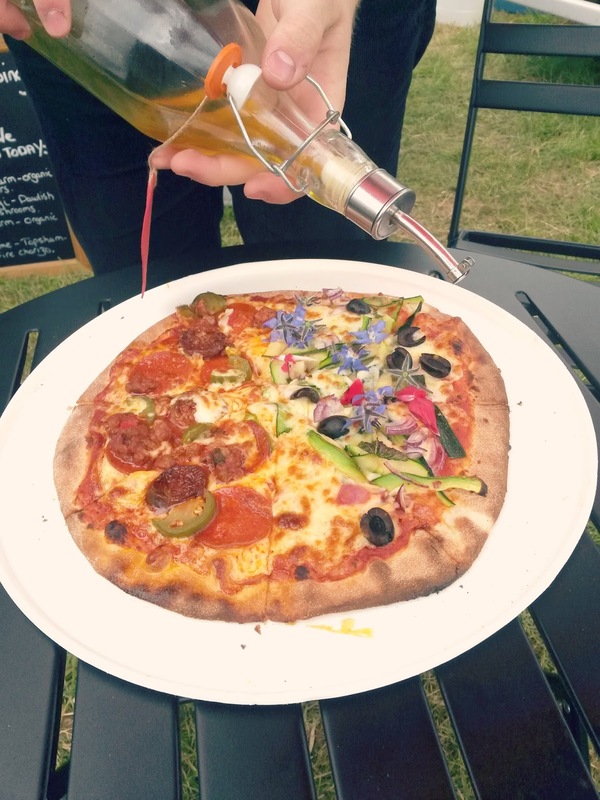 There was plenty of food on offer too: gourmet burgers from an Airstream, stalls with various treats and two Citroen vans for pizzas and crepes. We went to the Travelling Pizzeria both days where there was fresh, wood-fired pizzas with local toppings. Below is half Allotment and half GI Joe so included marinated courgette, onions, olives, mozzarella, spicy meats and jalapeños, topped with edible flowers. Needless to say, it tasted great and was reasonably priced too at £10. 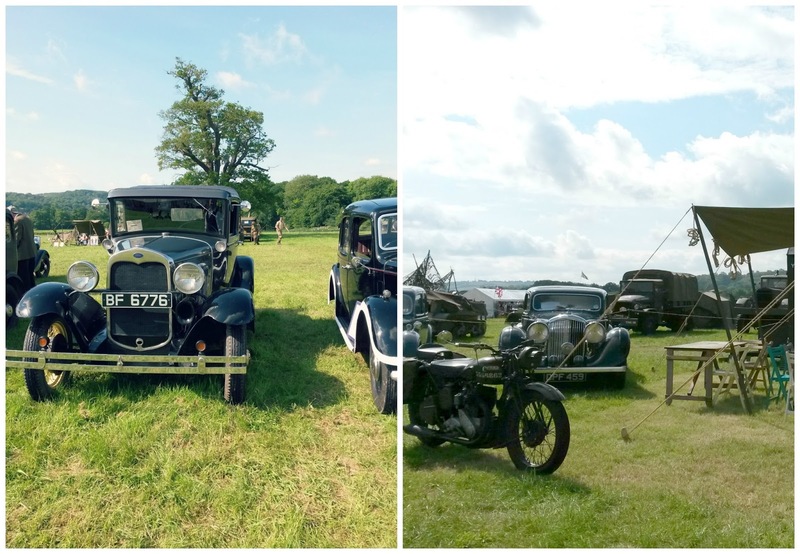 Around the showground there was plenty to see, from craft demonstrations, vintage stalls and classic cars and tanks. It was very interesting to see the progression of styles, but of course my particular favourites were the fellow Morris Minors and also this little cream Austin *sigh*. On the field we also watched the tanks and skirmish, where actors dressed as soldiers and showed the audience how an attack would take place in World War 2. It was so noisy when even just 3 or 4 guns were firing at once, I can't even imagine how awful it must have been in reality. The whole weekend was very thought provoking and really made you think, not just about the fashions and 'vintage' aspect but also the reality of rations, war and make-do-and-mend which really wasn't as glamorous and come films make out. As well as this, the show raised £4,000 for Army Benevolent Fund and the Children’s Hospice South West last year and is run entirely by volunteers, so I really can't fault the weekend at all- the set up, entertainment and atmosphere was all brilliant. Finally, I did come back with a few treats for myself (total spend only £9!). I spotted these gold tone clip on earrings and brooch to go with my evening outfit and - in complete contrast - I found the perfect pair of leather driving gloves to wear taking Betty out for road trips! They have obviously been well loved so they have a certain charm about them, as well as being comfy and fun to wear with the two tone colour scheme. I hope you've enjoyed reading about the show! What have you all been up to recently?